How to create vector roads center lines from raster? 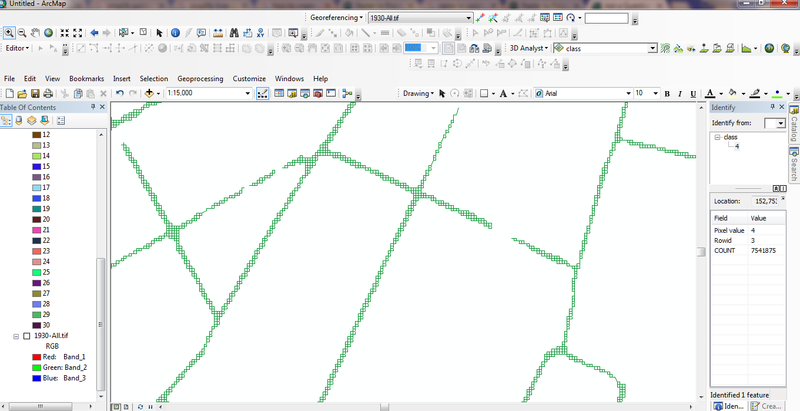 I need to know how to create roads vector center lines from raster using ArcGIS. I have tried to use Iso Cluster Unsupervised classification tool to classify raster and set it to 30 classes. After that Reclassify tool to filter the roads cells from other values. After that I have used "Raster to polyline" tool and checked the Simplify box, but the results are a lot of lines looking like a polygons (screenshot). I need it to be just one road center line. This is a classic topographic map and I have a lot of roads to process so this can`t be a semi-manual process, I need it automatically as much as that is possible. Does anyone know better way to solve my problem? I have solved the problem using ArcScan toolbox. Great tool, exactly what I need. Not the answer you're looking for? Browse other questions tagged arcgis-desktop raster shapefile vectorization or ask your own question. Extracting raster cells from imagery based on RGB value using ArcGIS Desktop? Why is quantile reclassification method yielding classes of vastly different cell counts? Getting rid of clouds from Landsat using ArcMap? Converting raster to vector by generating center lines? Extracting specific roads from raster image using ArcGIS Desktop? Creating a continuous raster road network using Polygon to Raster in ArcGIS Pro?